Torquay at the heart of the English Riviera as it likes to promote itself is a charming seaside town in South Devon. There are plenty of shops and restaurants plus an attractive harbour. The town with its mild climate has long been a popular UK holiday destination. Torquay is also home to the few gay bars/ clubs in the area. On a recent visit we popped into the Meadfoot Inn, popular with a slightly older crowd. There are the Steamer Gay and Keywest Resort Gay Saunas and up the road in Exeter there is the Vaults Nightclub. 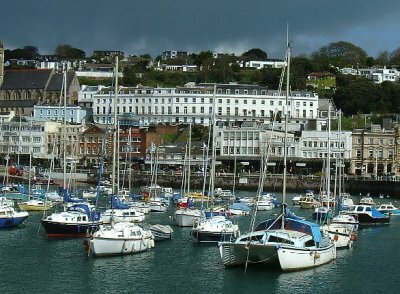 Apart from the local amenities Torquay is a good base for exploring the rest of the South Hams area including Dartmouth, Kingsbridge and Salcombe and some of the most beautiful coastlines in the country. If you're in the area for a week and have access to a car then get out and explore the area. Brixham is a charming little fishing town. Paignton has a large although admittedly red sandy beach popular with wind surfers. Further down the coast is the charming town of Dartmouth with its famous Naval College. Dartmouth along with Salcombe are both situated on beautiful estuaries and are therefore popular with the sailing fraternity. There are also some beautiful beaches (Mill Bay and Sunny Cove) on the opposite side of the estuary from Salcombe. These can be reached by taking the small ferry from Salcombe or by car by heading for East Portalmouth via Kingsbridge. However beware, many roads in this part of the country resemble elephant tracks so be prepared to pull into the edge of the road if you encounter a card coming in the opposite direction. As we did, you might consider hiring a country cottage of which there are plenty. The local tourist information centres can probably supply you with a list of available accommodation. This makes sense if there are a large group of you traveling together and can work out more slightly more cost effective than staying in a hotel. 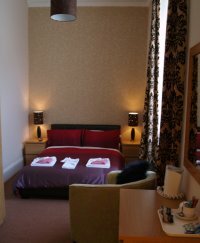 If you wish to stay in specifically gay friendly accommodation then Torquay is once again the place to stay with some very well established and popular gay friendly hotels and guesthouses. Torquay does tend to fill up very quickly in the summer months so if necessary check out Booking.com or LateRooms for hotel availability and last minute offers. If you contact any of these hotels/guesthouses please mention you saw them on Gay Britain Network - Gay Travel Guide (www.gaytravel.co.uk). Description: For Friends, Lovers & Anyone Wishing to Get Away from it All. 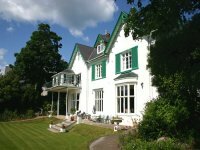 Since 1973, Englands First & Foremost Friendly Hotel for Gay & Lesbian Guests. The Cliff House, originally the home of a millionaire, is now thoughtfully converted to an exclusive luxury hotel set in delightfully secluded gardens at the sea's edge. Here one can enjoy the peaceful view of the sea from the terrace which fronts the comfortable bar lounge. Description: The Croft is ideally set in an acre of secluded gardens overlooking picturesque Cockwood Harbour and the Exe estuary, approximately one mile from Starcross on the A379 Exeter - Dawlish road situated between Exeter & Torquay & A two minute walk to 2 of Devon's finest pub / restaurants enables you to sample the local seafood for which the area is renowned. Own key no restrictions. Safe off road parking for cars, boats etc. Gay Friendly - Pets welcome - no charge. Whether you are looking to have a leisurely holiday relaxing by the pool or a more adventurous time exploring the Jurassic Coast and surrounding areas, Key West situated in lovely tranquil part of Torquay minutes away from Meadfoot Beach, the harbour and the town centre offers you the perfect destination. The resort offers en-suite guest bedrooms or self catering apartments. A spacious Bar, open to non residents, with Sun terraces, a large dining area, health club & outdoor pool all set in beautiful gardens. 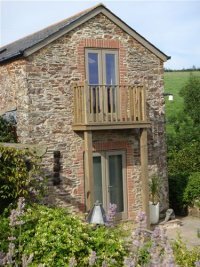 Description: A beautifully converted stone barn in a stunning 2 acre setting overlooking Dartmouth Golf Course and surrounding open countryside. 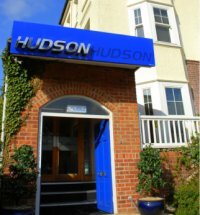 We are situated just a short distance from the town of Dartmouth and the lovely beaches of Blackpool and Slapton sands. The barn offers total peace and tranquillity in a most wonderful and relaxing environment. Is very tastefully decorated and furnished retaining many original features � the open plan living space has exposed wooden beams and a wood burning stove for those cosy winter nights! The floor to ceiling windows offer lots of light and wonderful countryside views�. The spacious bedrooms are all en-suite with big showers! The double bedrooms have king size beds � and superb mattresses! The barn has state of the art underfloor heating throughout�. Description: Torquay Hotel, Frognel Hall is a beautifully adapted Victorian Villa in Torquay, Devon, in the heart of the English Riviera, offering superior and superb service and accommodation in Torquay. Only 500 yards from the Harbour and also beautiful Meadfoot Beach. 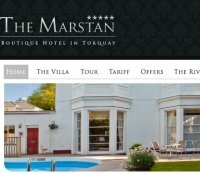 "Gay friendly"
Description: The Marstan Boutique Hotel in Torquay, South Devon is one of only four establishments in Torquay to have received a five star guest accommodation rating. Situated just 2 minutes from Meadfoot beach and 10 minutes from the town centre and gay venues. Gay friendly Hotel. 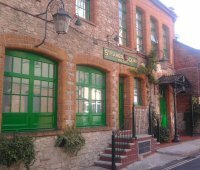 The Meadfoot Inn is Torquay's oldest LGBT Bar situated on Meadfoot Lane, which is a two minute ...walk from the harbourside.The boys from the Meadfoot aim to bring you a pleasent atmosphere which can be enjoyed by all age groups and our goal is to make our viistors as welcome as our locals. The main aim for this group is so people who have come to visit us can keep in touch with with people that they have met in the pub as well as keeping up with what is going on in the pub. A bar menu is available every day up to 8 .30pm as well as a freshly prepared Sunday Lunch between Noon & 4 pm. Steamer Quay was opened in March 2004 and is Devon's largest Sauna offering both men only and mixed sessions. Steamer Quay is located on a discrete side street in Torquay town centre. Entrance, Reception, Shop, Locker room, TV lounge, Bar and Cafe. Enjoy an ice cold beer or a superb coffee, tea or hot chocolate, all at very reasonable prices. Free internet access in lounge area. The latest Gay Times, Attitude and other magazines are available to read here. The shop sells a small selection of toys, rings & other goods at very reasonable prices, no need to be a spa customer, just purchase at reception. This a la carte restaurant is the only gay owned restaurant in Torquay. It is not on the high street and its food is of excellent quality. A real diamond amongst the diamonte. Known by people in Torquay as the 'locals' restaurant. Opening times: Monday - Sunday from 7pm.